Of those younger than 30, 61 percent completely agree that “it’s my duty as a citizen to always vote,” up from 46 percent in 2007, according to Pew Research Center. Although the act of voting is thought to be important among 61 percent of people under the age of 30, the willingness to take sides is less prevalent than ever. “Young adults today are much more likely to be unaffiliated[religiously] than previous generations were at a similar stage in their lives.,” reported the Pew Forum on Religious and Public Life. Going into ministry, Shuab says he finds importance in being politically aware, but not in being highly involved. The tone of the presidential elections changes drastically based on a person’s location. In Washington D.C., and Canton, both majority democrat cities, all the buzz is about “who will win” Ohio. But those may be their only similarities. On campus there have been several events such as the Dead President’s Society debate watching party, and an informative panel discussions about key issues presented to Blossom Hall residents by professor of international politics Scott Waalkes and assistant professor of political science David Beer. Compared to the thriving political scene of D.C. the involvement in politics on campus among young people looks minuscule. Washington may be the only city in which sports bars are packed for the debates hours before they start with pro playoff games muted. Young people in Washington gathered all three nights of the debates and could be seen crouching over phones contributing to the 17.5 million tweets in the first two debates alone, reported by Bloobmerg’s Tom Keene. Sam Taylor, senior psychology major is attempting to bring some of that spirit to campus. As a field organizing fellow for Organizing for America, campaigning for the Obama campaign, Taylor organized a voter registration opportunity for students outside the cafeteria. His efforts, assisted by seniors James Talbert and Catherine Kenney, helped over 200 Ohio students to register to vote. Taylor said students seem to be extremely vocal on Facebook as to who they will vote for and why, but they are not active outside of the online world. “If we’re measuring student participation based on Facebook pages we have the most politically active generation of all time,” he said. Beer said the parties in the U.S. are getting weaker. “The U.S. has very weak parties, the only thing that makes you a certain party is that you call yourself one. You could be a pro-choice republican as much as a pro-guns democrat,” Beer said. 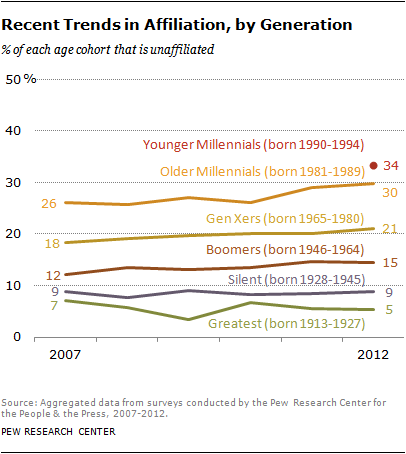 Beer said it’s hard to draw a conclusion about the millennial voting trend when some of the trend is among the 18-24 age group which is consistent throughout history. Beer is among the group of political science and history professors who are trying to give students the opportunity to be more informed. Weekly Wednesday news discussion lunches aren’t turning out to be what they had hoped, though. “We’re having a hard time building up steam, there have been times where the faculty outnumbers the students,” he said. They are planning one last event for the election; in conjunction with SAC there will be an election night party with pizza and games such as candidate impressions. In D.C., after voting on the 6th, over 400 local churches will be partaking of communion on the national mall. This is a tradition started by a few Mennonite pastors and has spread nationally to bring unity to the divisions brought about by political opinions. Chelsea Weikart is a contributing writer for The Aviso AVW and is spending the semester studying in our nation’s capital through The Washington Journalism Center. An error in an earlier version of this story incorrectly reported Sam Taylor’s major. Sam Taylor is a senior psychology major with a political science minor. An error in an earlier version of this story incorrectly reported the name of the history and social sciences club. The history and social sciences club is call the Dead President’s Society.